Although I drink hot chocolate all year I guess January is well into the official hot chocolate season. I'm remarkably fussy too when it comes to hot chocolate, particularly I would say I dislike more than I like, and am often surprised by just how flavourless some expensive varieties are. I think that might be my sweet tooth influencing me. I get on better with flavoured hot chocolates and to say Options are made with hot water and are low in calories I do think they do an excellent job. If you are having a healthier January following an over indulgent December then these drinks do make a guilt free chocolate treat. 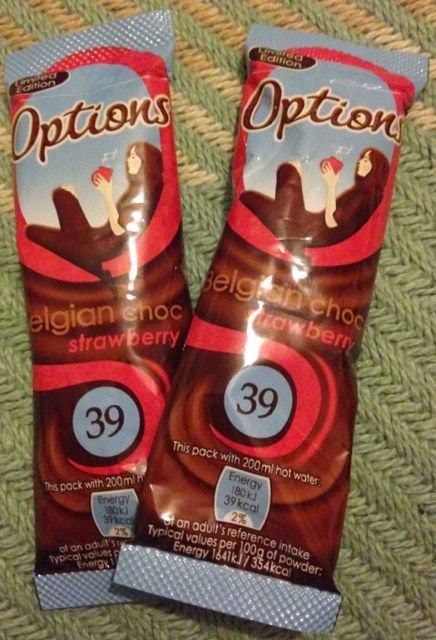 There is a new flavour out at the minute and I popped the kettle on ready to try out the new Strawberry hot chocolate. When I added the hot water I noticed that although it mixed up fairly reasonably I did have to work on a few lumps that needed extra stirring. I'm pretty sure that Options always used to mix up much more easily than this but the last few I've had needed a bit more effort. The aroma was nice there was plenty of chocolate but a nice fruity smell also. The flavour was good too. It was sweet and the strawberry taste was strong and full on. The chocolate worked well with it and it reminded me of the strawberry creams I'd been munching on over Christmas. If you are after a chocolate treat without too many calories these are just perfect, particularly on a cold winters night. Have you tried using a mini whisk to mix your hot chocolate? I find it's the best way to get rid of any lumps - add a bit of water/milk, whisk well with mini whisk rather than a spoon, then top up the water/milk to the top. Not a bad idea - I used to have a few years back and it was really useful - but it broke and never got replaced.